Believe it or not, Australia is a global leader when it comes to effective licensing and regulation of commercial RPAS operations. Developed by the Civil Aviation Safety Authority and covering both recreational and commercial operations, Australian drone laws are ever evolving as regulators strive to maintain control over the rapidly expanding, multi-billion-dollar industry. The increasingly frequent release of new drone tech combined with large scale and open public adoption has resulted in millions of pilots operating UAV’s in nearly every industry. It comes as no surprise then, that with situations like the Gatwick Airport incident becoming increasingly common that rules needed to be developed and enforced. Now onto the important part. Chances are you are here because you are interested in flying drones commercially, so we’ll try and keep this as simple as possible. Now that we understand the licensing requirements of different Remotely piloted Aircraft Systems, its time to look at the 3 different types of Licenses and certifications. The remote pilot’s licence is the most basic licence required by commercial pilots. A remote pilot licence (RePL) is your individual permission to fly. It allows you to fly for or be employed by a certified operator. This is the holder of a remotely pilot aircraft (RPA) operator’s certificate, or ReOC. On its own, a RePL does not grant you additional operational benefits/opportunities/indemnities when compared to someone flying in the sub 2kg category. It must be used in conjunction with a ReOC. This form of licence is ideal for someone looking to join an existing drone company as a pilot. All businesses that utilize drones for commercial gain must hold a Remote Operators Certificate (ReOC). Only one ReOC is required per business and all pilots that operate for the business are bound but the procedure, exemptions and endorsements contained within the document. A remote operators certificate is required by anyone looking to integrate drones into their current business operations or start their own RPAS business. 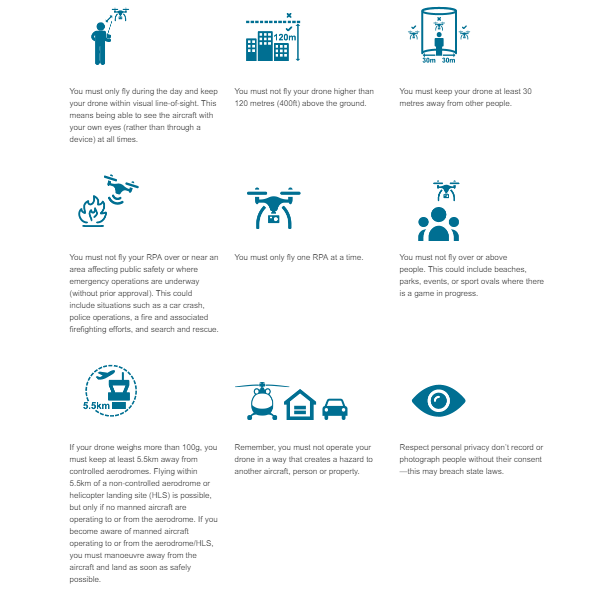 In summary, the above content sums up how to operate your drone commercially in Australia. If you’re looking to become a commercial drone operator, train with the No #1 drone pilot training academy which conducts training in Brisbane, Sydney, Melbourne, Perth, Adelaide, Cairns, Hobart etc. Click here to find out more about the courses.